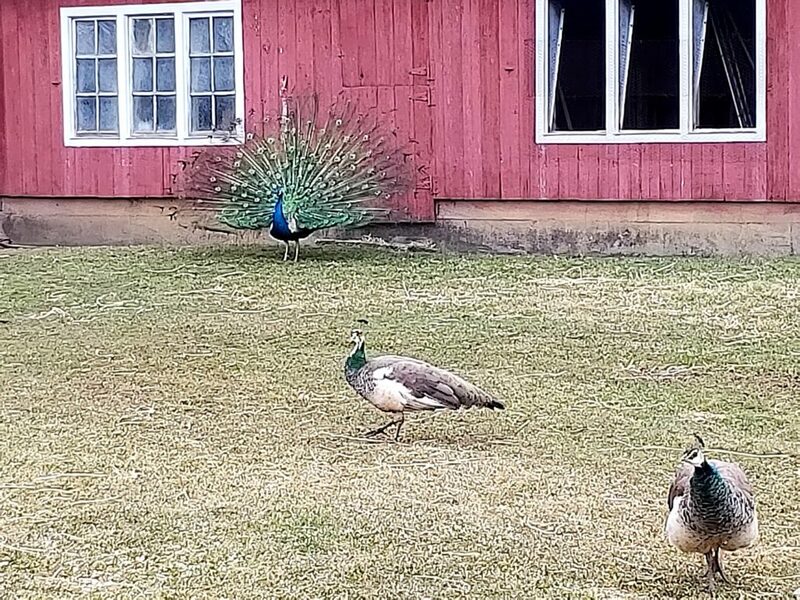 Now there are a lot of animals that you could find on the farm, but if you’re in our neighborhood and close to our farm – well it’s a pretty good chance that you are going to hear our peacocks screaming. We’ve had peacocks for more years than I can count, and our newest member to the flock – Charlie, has become the boss pretty fast! So I was in the house this afternoon and when there was quite a bit of noise outside, I knew right away who was the culprit. Yup, it was Charlie! Because we’ve had quite a few peacocks over the years, they all seem to have their own personality. Some of them would sit on top of the sheds and keep an eye out for the farm, some of the peacocks would sit in the barn window trying to look cool, and we’ve even had some that absolutely would not like certain vehicles as they drove by and they would scream as loud as they can. Honestly that was probably the funniest. We knew exactly when this one car would be close to our farm and they would scream until they were almost down to the corner. Well the weather is finally turning to Spring, and that means the peacocks are getting a little stir crazy.